The Mark Twain Zephyr is FOR SALE! Available exclusively through Rail Merchants Int'l. For more information and additional recent photos contact David Thebodo. (This page edited from the website of the Gateway Division of the greater Saint Louis area chapter of the National Model Railroad Association (NMRA), here). 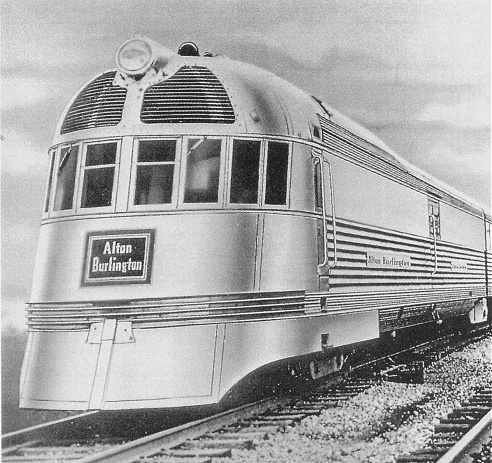 The largest fleet of named streamliners in the United States were the Burlington's Zephyrs. Competing in markets against the famed Eagles, Chiefs, 400's, Cities and Hiawathas on almost every route, the polished Zephyrs covered almost every route on the mainline of the Burlington and for years held the speed/distance title in the record books. 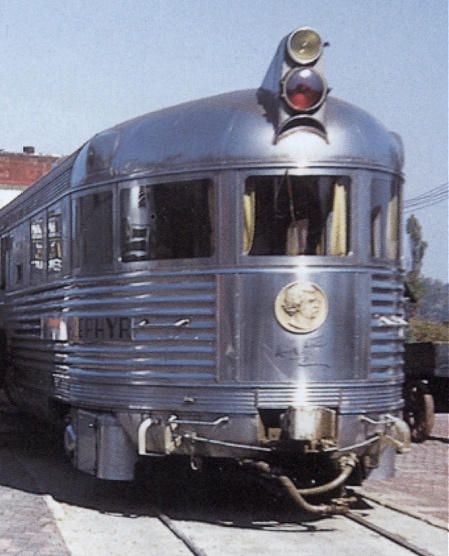 It's hard to believe that something as revolutionary as the Zephyrs started almost seventy years ago with the tiny, three-car Pioneer Zephyr and the four-car Mark Twain Zephyr. 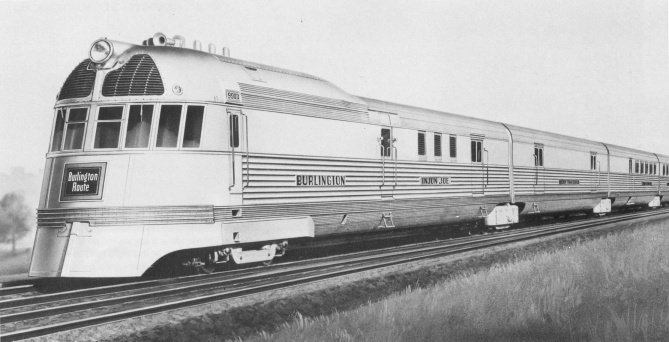 The original Burlington Zephyr had successfully raised patronage to overflow levels on the Kansas City to Lincoln route, expectations were high that the Twins would do the same for the highly competitive, revenue-challenged route between Chicago and the Twin Cities. The Mark Twain Zephyr too, was specifically designed in hopes that it would be successful on a third route - 442 miles round trip - St. Louis to Burlington, Iowa, through Hannibal, Missouri. Built at the Edward G. Budd manufacturing plant in Philadelphia, in partnership with the Electro Motive Corporation, the newest Zephyr's four units would be mounted on only five trucks. By articulating the 280' foot long train, three trucks and 34 wheels were eliminated from what a conventional train with a steam locomotive and three cars would have, affecting a considerable savings in weight. Articulation also eliminated slack action by having the front part of one car and the rear of the preceding one rest upon the same truck, held together by a sleeve joint, allowing it to round curves efficiently, yet unifying the whole train. Roller bearings were applied to all axles reducing friction, and maintenance. The train was propelled by a 660-horsepower, 8-cylinder, 2-cycle Winton 201A Diesel engine designed by General Motors, and built by the Electro Motive Corporation. It ran on ordinary fuel oil and operated with no spark plugs or ignition system, combustion being accomplished solely through high compression. The engine directly powered a General Electric GT-534 main generator, which provided current to two, GE model 716 traction motors mounted on the first truck. The lead truck had 36-inch wheels for traction, while all the others only had 30-inch wheels. The gear ratio of the power truck was 52:25 for a rated maximum speed of 117 miles per hour. The Mark Twain also had a belt-driven GT1177A-1 auxiliary generator, three CP-127B-11 motor-driven air compressors and two radiator cooling fans that were belt-driven from the engine. On board the lead unit, the MTZ could carry 600 gallons of diesel fuel, 80 gallons of lubricating oil, 140 gallons of engine cooling water and 12 cubic feet of sand. Loaded, with 92 passengers, the whole train weighed in at 287,245 pounds, which is considerably less than two ordinary heavyweight coaches! The lead unit, containing the power plant, a 30' Railway Post Office and a 15' mail storage area, used a cleverly selected homonym for the word engine and was named "Injun Joe." Almost identical to the power unit of the 9900, it varied only by inches in it dimensions and incorporated the cosmetic changes and operating improvements already in place on the Twins. The second unit (No. 506) was a 64' baggage and express car named "Becky Thatcher." The third unit (No. 551) named "Huckleberry Finn," held a kitchen an pantry in the fore section with a service counter separating it from a dinette comprised of 16 seats grouped in "foursomes" facing tables that were set up at meal time and removed afterward. Twenty additional chairs put the capacity of this car at 36 passengers. The final unit (No. 572) was named "Tom Sawyer," had coach seats for 40 passengers in the fore section, while the aft contained a solarium parlor-lounge with detached chairs for another 16 passengers. The design and interior finish of the passenger compartments were characterized by color harmony without elaborate ornamentation. Pastel tints of blue and green for the side walls, and ceilings finished in ivory formed a light and pleasing background for the flash of the stainless steel window frames, sills and trim. Coach seats were upholstered in green mohair; window drapes also of green and carpet of taupe; parlor-lounge chairs upholstered in Fenway blue fabric, window drapes in lemon gold, and platinum grey carpet made the Zephyr both pleasing and modern. Lighting was from diffused overhead tubular ducts providing scientific designed levels of intensity at eye level. The passenger compartments were equipped with radio and were climate controlled with thermostatically controlled steam heat and air-conditioning. Like the three preceding Zephyrs, the MTZ was streamlined from front to rear, with satin-smooth longitudinal surfaces gleaming like burnished silver. The 18-8 stainless steel, a non-corrosive alloy consisting of 18 percent chromium and eight percent nickel, has a tensile strength three times that of ordinary steel. The fluted outer skin was not only decorative, but due to its shape and the electric shotwelding process developed by the Budd Company, it became an integral part of the train's structural support. Even the underbodies of each car were encased in the stainless steel to eliminate wind resistance. After a brief, but triumphant tour of the East, the Mark Twain made its appearance on Burlington rails in Chicago on Columbus Day in 1935. The Burlington advertising department had already planned a series of exhibition and speed-trial runs for the four-car train before it entered revenue service. On October 14th the 9903 was shortened by crews at West Burlington by removing the baggage car to prepare it for the speed trials planned in conjunction with the Republican Valley Jubilee at McCook, Nebraska. The Chamber of Commerce of Hannibal hosted a luncheon for railroad officials and guests at the Mark Twain Hotel on October 25th, 1935. A thematic menu provided such items as Life on the Mississippi Cat Fish and Aunt Polly's New Apple Pie with Cheese - music was provided by the Bates Ensemble. Special guests were Ossip Gabrilowitsch, then conductor of the famed Detroit Symphony Orchestra, his wife Clara Clemens Gabrilowitsch, daughter of Samuel Clemens and their daughter, Miss Nina Gabrilowitsch. At 2:00 p.m., October 25th, the coast to coast broadcast over CBS began and so did the dedication ceremonies. The honors of christening the new Mark Twain Zephyr fell to Clemens' granddaughter, Nina, also the great-granddaughter of John M. Clemens, a key player in the creation of the Hannibal & St. Joseph Railroad in 1846. The famed "Hannibal & St. Joe," started in Hannibal in 1851 and was completed to St. Joe in 1859, the first railroad to reach the Missouri River, and the first and only railroad to carry the U.S. Mail for transfer to the Pony Express at St. Joseph. This same railroad was one of the earliest predecessors of the railroad that was dedicating it's new Zephyr in Hannibal that day, the Burlington. There was an eleven-city competition in which three children dressed to represent Mark Twain's three most-famous characters Tom Sawyer, Huckleberry Finn and Becky Thatcher. Trios from Burlington, Ft. Madison, Keokuk, Hannibal, Canton, LaGrange, Quincy, Louisiana, Clarksville, Elsberry and St. Louis were escorts to Miss Gabrilowitsch throughout the day. The first regular service trip of the Mark Twain was made from Hannibal to St. Louis on Sunday, October 27th. The scheduled trip for the Mark Twain was a round-trip journey from St. Louis to Burlington, however the railroad thought it appropriate to split the schedule for the first day and begin service at Hannibal. The normal schedule began Monday morning, October 28th at St. Louis. Operating the MTZ was not without it's challenges. Turning a train at Burlington was never a problem, until the Operating Department began preparing for the fixed-consist, 280-foot long train. The solution would be to construct a wye at Burlington. Those familiar with Burlington's yard know that it hugs the Mississippi River to the East and has businesses directly to the west. So the question was, where do you build a new wye? A ravine was discovered about a mile south of the K Line's junction with the Chicago-to-Denver mainline that, with minor effort, a wye could be constructed westward from the mainline into the limestone faced ravine at Cascade. Upon arrival from St. Louis, the MTZ would wye at Cascade and back into the station at Burlington on Track 1. After it made connections at Burlington, Iowa with the CB&Q's Chicago-Denver Aristocrat from both directions, the MTZ was facing the right way for a direct departure. 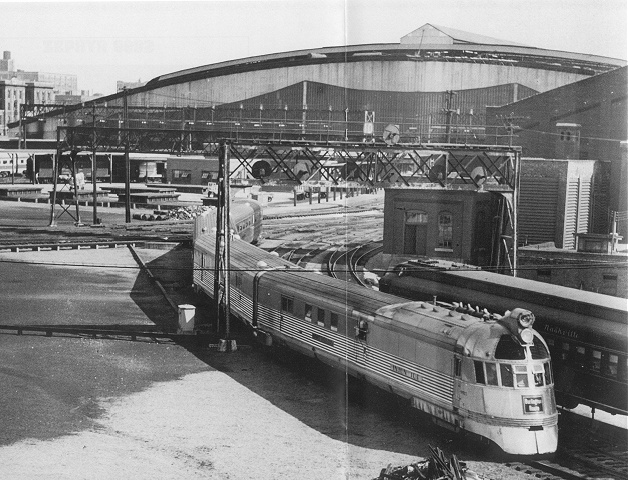 On the other terminus of the MTZ, common operating practice was to be backed into the St. Louis trainshed by a T.R.R.A. crew and switcher. Since the Zephyr was built for streamline operation, the front coupler was designed to be retractable, however, its design was flawed and it would not always work correctly. Sometimes it would collapse while it was engaged, or fail to remain in its proper working position at all times. Such problems with the cantankerous coupler while a T.R.R.A. switcher was standing by to pull the train could easily throw a wrench into the tightly scheduled routine at the tower. The solution was to have the train pull into the station head-first, and then after it had been emptied, the T.R.R.A. switcher would pull the train out using the coupler on the rear of the observation car. Servicing the Zephyr also created a unique procedure in St. Louis. The normal operation was to separate the power and take it to Fourteenth Street for servicing and the remainder of the train to one of the other yards for servicing and cleaning. However, with the fixed consist of the MTZ, this was not possible. For the 9903 and her sisters, they were taken complete to the T.R.R.A. 's North Rankin Yard where the locomotive unit was refueled, lubbed, sanded and watered by means of a diesel tank truck stationed at the yard just for the Zephyrs, while at the same time the rest of the train was being cleaned. After being refueled and washed, the entire train was taken back to the train shed by a T.R.R.A. switcher, observation car going first. 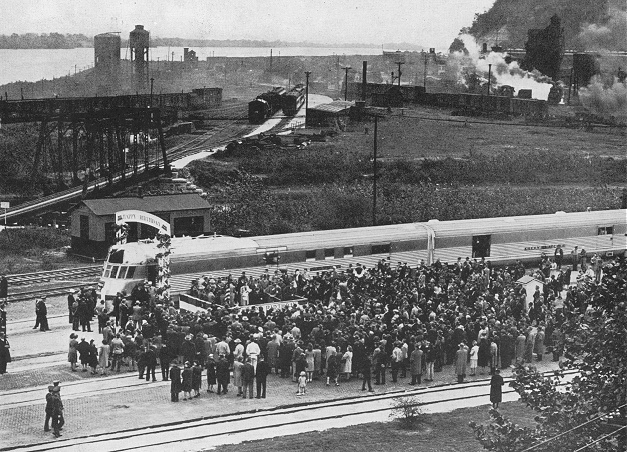 The Mark Twain Zephyr was well received by patrons and passenger traffic increased remarkably. However, less than a year into it's new service, the management of the CB&Q had other plans for the MTZ and its sister, the original Zephyr. The increases in passenger levels on the three Zephyr routes made an impression on management, for example, in July and August of 1935, over 5000 passengers could not be accommodated on the Zephyrs. To meet the demand, the Chicago - Twin Cities service was doubled, each train set making two complete round trips per day, but that proved to be insufficient. The solution was to increase the size of the trains, but the 600 hp Winton engines would not handle the number of cars that was projected to handle the demand. The Burlington decided to try a Zephyr on the Chicago to Denver route. Two ten-car trainsets were placed on order that would be pulled by two detached shovel nose diesels. Shortly thereafter, two new six-car train sets were ordered for the Twin Zephyrs, also with detached power units. So what does this have to do with the Mark Twain? 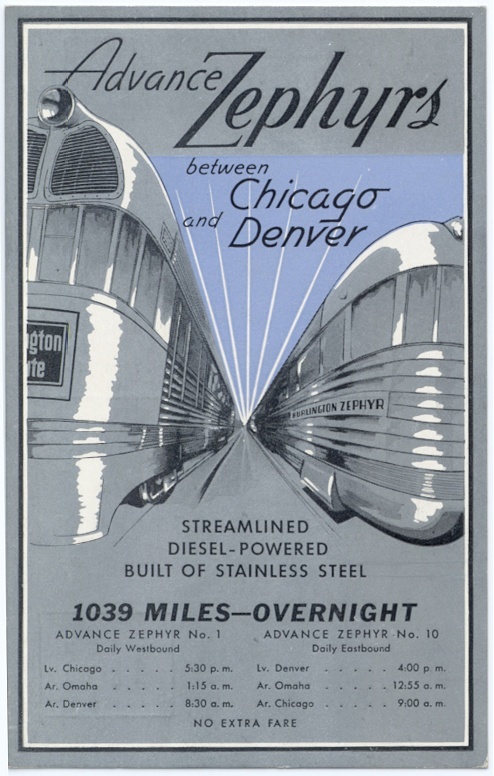 To publicize the new Denver Zephyrs, and to start building a larger passenger base, the Burlington reassigned the MTZ and the 9900 to be the Advanced Denver Zephyrs, one running each direction between Chicago and Denver on a 16-hour schedule daily. 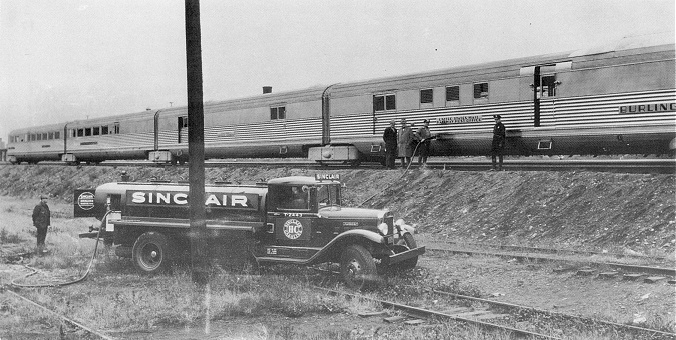 This service, to capitalize on summer business and to protect the US Mail contract, began on May 31, 1936 and operated until the permanent Denver Zephyr equipment was placed in service. Although therewere no sleepers on either train, the timetable provided a 5:30 PM departure from Chicago with arrival in Denver at 8:30 AM the next morning, 1034 miles at an average speed of 64.63 miles per hour. Departure from Denver was at 4:00 PM with a 9:00 AM arrival in Chicago. Business on the Advanced Denver Zephyrs was 100% of capacity with between 70 and 75% through traffic. The trains operated consistently on time and attracted not only passengers, but trackside viewers as well. It is recorded that as many as 200 people per day came to see the Zephyrs each day at stations like Galesburg and Burlington. For a short time between November 8, 1936 and December 18, 1936, the MTZ provided Chicago to Twin Cities service. 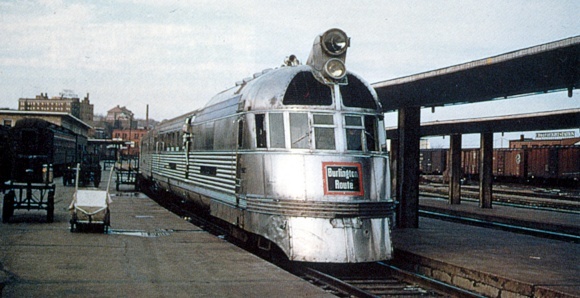 The MTZ returned to its intended route out of St. Louis to Burlington that December, but would be reassigned again in September of 1938 to the St. Louis to Kansas City route of the Ozark State Zephyr. While in this service, the familiar Burlington Route herald on the nose of the 9903 was altered to read "Alton Burlington" reflecting the joint route with the Alton between St. Louis and KC. However, other markings on the MTZ remained and the passenger timetables still show this train as the Mark Twain Zephyr even though it was not running to Burlington. In January of 1953, after three and a half years, the MTZ was assigned to service with the 9900 between Galesburg, Illinois and St. Joseph, Missouri, via Quincy. The Mark Twain Zephyr's last assignment starting in May of 1957, would bring it back home to serve the St. Louis to Burlington market until its retirement in May of 1963. An interesting side note is while the Zephyrs were designed for speed, the Mark Twain Zephyr, with its 60 stops on its original 442-mile round trip, averaged only 40 miles per hour, even though top speed on the run was 80 miles per hour. Compare this to the 66.3 mile per hour average of the Twin Zephyrs with only six stops. After retirement, the Mark Twain Zephyr was stored at the West Burlington shops until it was purchased by Mr. Frank Dashner of Glenwood, Iowa in June of 1960. His untimely death halted plans to make the trainset into a restaurant, so the train remained at West Burlington. In June of 1962, the train was acquired by Ernie Hays and placed on exhibit at the Midwest Old Thresher Association grounds in Mt. Pleasant, Iowa. In 1972, after many years of neglect, the train was sold to Alex Barkett of the Building Leasing Corporation, and moved to Kansas City. In 1987 the trainset was moved to the Chicago area where it remains in a secured section of a railroad equipment company awaiting a benefactor to restore it to it's former beauty. Plans are under consideration to move the historic trainset to milepost 256 on the CB&Q Chicago to Denver mainline at Fairfield, Iowa. There it would be displayed and made more accessible to potential buyers. For information, please contact David Thebodo at 641-472-2020 or caboose@railmerchants.net.